A device that’s fine for Apple users, but less inspiring for those with a Windows PC. The Apollo Cloud 2 Duo does a few things very nicely, but not enough to warrant its high cost or being chosen above similar hardware from Western Digital or Synology. 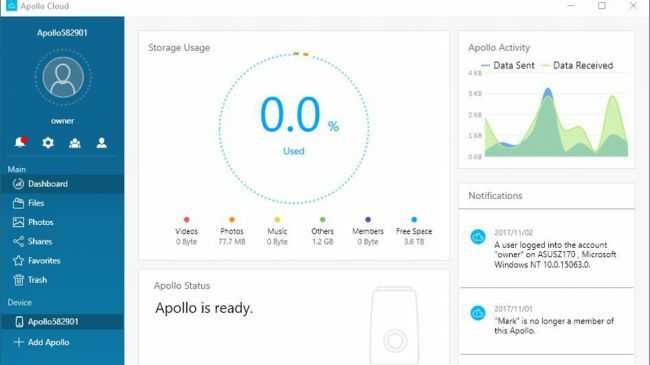 The Promise Apollo Cloud 2 Duo 8TB aims to provide lots of personal cloud space for those who lack confidence and don’t necessarily take for granted that their global cloud services will always be there. A little paranoia goes a long way with technology, we say. And the Apollo Cloud 2 Duo is Promise’s latest attempt to provide a simple to deploy and configure NAS system that is built to work with both iOS and Android devices, along with the Mac and PC. The product retails at around £499 ($449 in the US). From an aesthetics perspective, the Cloud 2 Duo could be viewed as either an elegantly curved monolith or an oversized coffee grinder, depending on the beholder’s generosity. It pushes the minimalist ethos hard, so much that on our first viewing we assumed that the drives weren’t accessible by the user. That perception was incorrect – it’s just that getting access to them isn’t straightforward and involves both reading the manual and having a small cross-head screwdriver to hand. 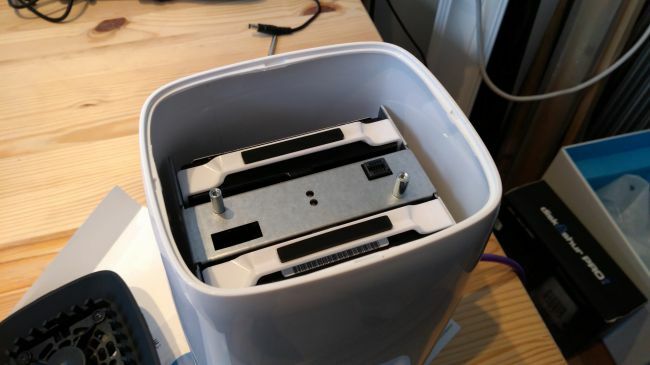 Pulling off the glossy white cap on top reveals two screws that release the fan assembly below, and with that removed the two drives can be yanked out. If you have any issues with the unit, looking inside the device is a worthwhile exercise, because between the disks are some colored LEDs that give you hints as to what might be wrong with the drives. Or they can at least tell you which of the storage devices you should be replacing. The outside has few distinct features beyond the touch-sensitive power button on the front, with integrated status light, and the LAN and USB ports on the rear. Regrettably, there isn’t any on/off switch, so the system remains powered even in a soft shutdown. Inside, the drives are vertically mounted to a motherboard on the floor of the case, and have a single 50mm fan suspended above them that draws air from the base and vents it out of the top. 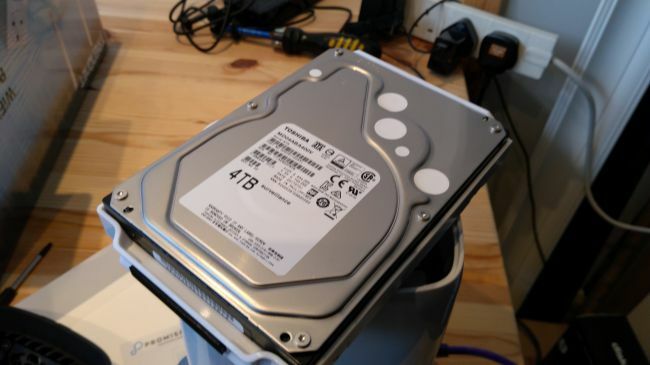 Our review model was supplied with two Toshiba MD04ABA400V 3.5-inch 4TB drives. That’s an odd choice, because Toshiba made these drives for surveillance work, and not specifically for NAS deployment. Toshiba’s N300 NAS drives cost less than these, so why Promise chose them is a mystery. Less of a conundrum is how the Cloud 2 Duo operates, as it is remarkably straightforward for anyone who has owned NAS storage before. Once the system is activated, you can access a simple web-like interface from your computer or mobile device app. Configuration is an easier exercise from a PC or Mac, but can be accomplished from a mobile platform. Truth be told, there is relatively little to do. Once you’ve established access, you can register the device to an owner profile, and invite other users (up to 39) to your cloud storage cabal. The ‘Dashboard’, as Promise calls it, also enables you to reconfigure the RAID mode and review the contents that you’ve stored on the unit. By default, the two 4TB drives are configured in a resilient RAID 1 (mirrored) mode, but you can alter this to RAID 0 (striped) if capacity is more important than data protection. These units can be buddied to one another, making it possible to mirror the NAS to another Cloud 2 Duo, given that it has the same amount of space and compatible drive layouts. 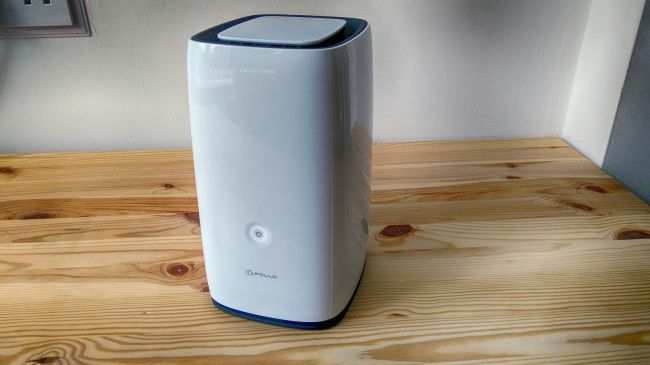 As these devices go the performance of the Cloud 2 Duo is good, though not the best we’ve seen. On a PC using a mounted volume, CrystalDiskMark achieved read speeds of 107.6MB/s and wrote at 97.44MB/s. We suspect that it might go a little faster with proper NAS drives – like Seagate Iron Wolf or Western Digital Red – in there, but those numbers are more than acceptable. Beyond those headline figures, there isn’t much else to say about the performance. As we worked with the Apollo Duo, we realized how much of an Apple Mac-centric design it is, and how the PC part of this equation was most likely an afterthought. A mild hint of this came when we connected it to our network, and it failed to appear as an icon as a computer, media device, or as part of the network infrastructure. In short, there doesn’t appear to be a discoverable SMB service here, only an AFP Apple protocol. You can mount a location on the Duo using a provided PC app, and sync a folder between the two, but this isn’t much like most DNLA-capable NAS boxes we’ve seen. You can reference it with a name or IP number (as in: \\192.168.1.187), but you can’t define a workgroup or define any Domain/LDAP relationship. Equally, the cloud functionality has been created to address a very narrow channel of uses. 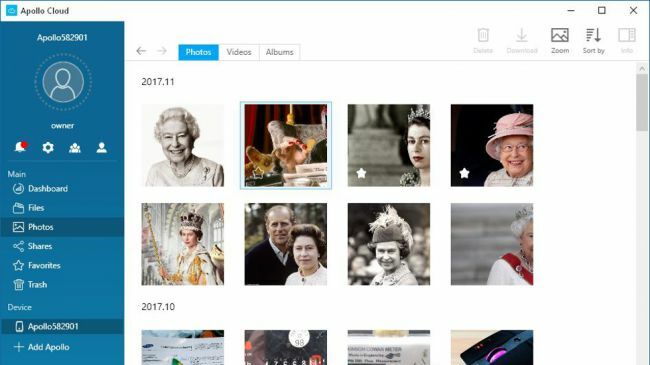 What it can do on iOS and Android is secure photos, videos, music and other known documents, ignoring all the other cloud data that falls outside those basic definitions. A selling point that Promise makes in its promotional material mentions how this device can automatically create Smart Albums based on using facial recognition tags that are applied by Apple and Google Cloud stored images. Unfortunately, this only works on Android in the US, as that functionality is disabled beyond those geographic borders. Creating Smart Albums by location (GPS tag) works, but there is no way to create or change tags in the viewing application should you wish to more accurately place them. Compared with the Cloud Sync functionality that Synology has in its NAS boxes this solution is remarkably limited. It doesn’t address the fact that many people use Dropbox, OneDrive, Amazon S3, Baidu Cloud, Box, Azure, HiDrive and a dozen other cloud services. Sadly, cloud support isn’t the only feature that Promise tailored for very selective use. The one (and only) USB port only works with NTFS, exFAT and HFS external storage devices. Amazingly FAT32 isn’t included, probably the most common format for memory cards and flash devices. And, on that subject, most NAS boxes support sharing printers on USB or connecting to a UPS, but neither of those is supported here. There should have been two USB ports at least, and FAT32 (along with maybe ETX4 formatted) drives should have been accessible. We could go on, but the list of declined opportunities and missing features is excessively lengthy. Most of the issues with the Cloud 2 Duo revolve around finding the balance between ease of use and providing long-term useful functionality. But perhaps the biggest stumbling block that this product faces is pricing. As we mentioned at the outset of this review, it will set you back around £499 ($449 in the US). For less outlay Synology’s DS218j DiskStation and two 4TB NAS drives is an option, and it’s a solution that does significantly more than the Apollo Cloud 2 Duo. Equally, the Western Digital My Cloud Mirror is just £364 ($399 in the US) and offers a similar but more pliable platform. 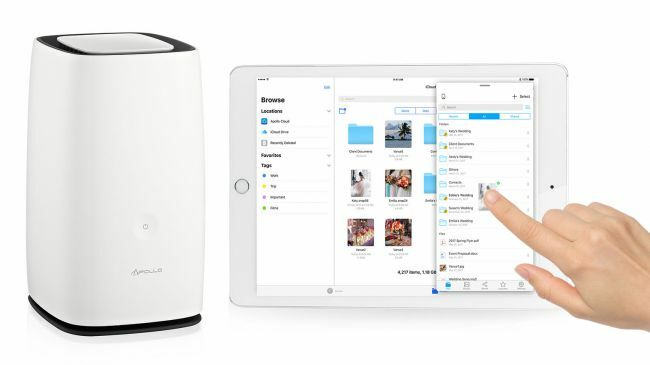 If you’re an Apple fan and want something simple that you can use to secure cloud data from your iPhones and iPads, along with Time Machine on your Mac, then the Apollo Cloud 2 Duo is perfectly specified. However, that statement does assume that you’ll never outgrow those initial requirements. In its present form, this isn’t a flexible system where the user can easily bolt on new functionality as their needs evolve. For PC and Android users, there are cheaper options available that can do everything the Apollo NAS can do, and so much more. 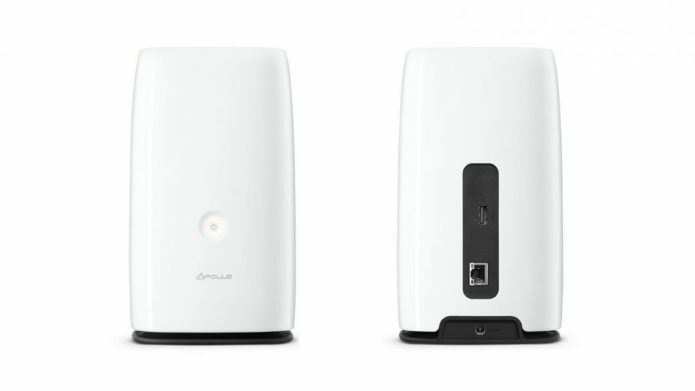 In those ecosystems, the Cloud 2 Duo looks heavy on cost and light on functionality.